Last week the United Nations spin machine went into overdrive as the Intergovernmental Panel on Climate Change (IPCC) issued a summary of its latest assessment of the state of the climate.2 The Summary for Policy Makers was prepared by politicians and bureaucrats representing the governments of many countries that have invested vast amounts of taxpayers’ money into projects designed to stop man-made global warming. The fact that this summary was put together by political representatives of UN member nations, rather than by scientists, has damaged the credibility of the IPCC. This is especially the case when some of those involved are understood to be affiliated to environmental activist groups. The IPCC produces climate change reports every six years or so. They involve three working groups: WG1 deals with the evidence, WG2 deals with the impact, and WG3 with policy responses. The 1,000 plus page WG1 report, on which the newly issued summary is based, will soon be released, but the other two reports are expected next year. On top of this, the “Climategate” scandal in 2009, clearly demonstrated the extraordinary lengths to which key IPCC authors were prepared to go to deliberately drive up world-wide alarm about global warming and climate change. However, before going any further, we should remind ourselves of some facts. The earth’s atmosphere is made up of 78 percent nitrogen and 21 percent oxygen, with greenhouses gases making up the remaining 1 percent. Of that 1 percent, the only gas found in significant quantities is argon at 0.93 percent. Carbon dioxide is a miniscule 0.038 percent and methane is present in even smaller quantities – 0.00015 percent. The balance is made up of traces of neon, helium, hydrogen, nitrous oxide, and ozone. Water vapour is also a significant greenhouse gas but the amount of water vapour in the atmosphere varies quite considerably from almost 0 percent in arid regions to around 4 percent. Greenhouse gases play a critical role in enabling life on earth. They act like a blanket, retaining enough of the sun’s heat to keep the earth at an average temperature of 15 degrees Celsius rather than minus 18 degrees Celsius – if greenhouse gases were absent. The gas that the IPCC and radical environmentalists like to demonise is carbon dioxide – the gas of life. All living creatures breathe in oxygen and breathe out carbon dioxide, which plants are able to utilise – through the process of photosynthesis – to capture the sun’s energy and create food. That’s why as school children were all taught in elementary science that carbon dioxide is a key part of the carbon cycle, and that it is at the heart of the food chain. Atmospheric CO2 concentration is just barely above the life-sustaining levels of 150 ppm. For life to have real buffer against mass extinction, CO2 needs to be closer to 1000 ppm. After a warm period, the earth would eventually start to cool and snow would fall on mountains, reflecting more and more of the heat from the sun. The poles would then freeze over, glacial ice would start to cover the land, sea levels and atmospheric carbon dioxide levels would start to fall, and an ice age would begin. Within these ice ages there are cycles of warmer weather called interglacial periods, where the earth’s temperature increases but permanent snow and ice remain present. These are followed by colder glacial periods where the temperature cools and glacial ice sheets advance. 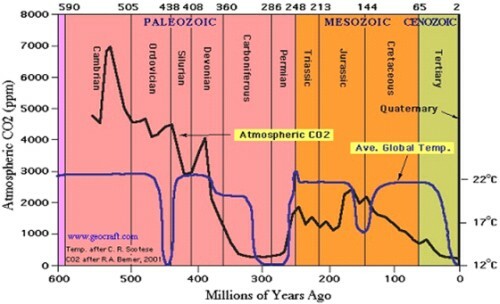 At the present time, the earth is in an interglacial period within an ice age. These interglacial periods last for around 10,000 years, followed by glacial periods of around 100,000 years. With the present interglacial period having already lasted for around 10,500 years, many scientists believe that we are now overdue for a new glacial period. “The report says the slowdown in observed warming could be due to natural variability and ‘over-sensitive responses’ to greenhouse gases in some climate models. Perhaps the most telling figure in the report is that the range of sensitivities has been lowered. The new lower bound of 1.5°C would mean that warming in the 21st century will be about the same as the 20th century. Nobody is going to be very alarmed about that! There is no longer any IPCC consensus on the best estimate of climate sensitivity. The range of values for climate sensitivity is lowered. The 16-year temperature standstill or “pause” is officially recognised (if reluctantly). The anthropogenic share of past warming is reduced from “most” to “more than half”. Warming for the next hundred years will likely be similar to the last 100 years. Temperatures through to 2100 are expected to remain below the 2°C threshold. Sea level rise this century is predicted to be non-threatening. It appears that the UN is using this round of IPCC reports to set the scene for another attempt to establish a global treaty to replace the Kyoto Protocol, which expired last year. Their new proposal is to impose a ‘carbon budget’ for humanity, which would limit the amount of carbon dioxide that can be produced by mankind to no more than one trillion metric tons in total. 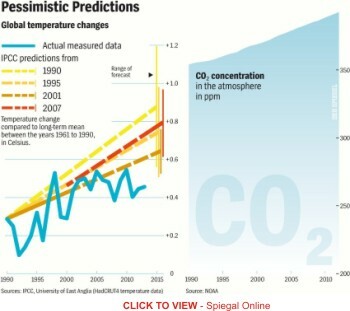 The IPCC claims that if more than that is produced, then dangerous climate change would begin to occur. And with half a trillion tons having already been produced since the beginning of the Industrial Revolution, the IPCC expects the upper limit to be reached around 2040. Meanwhile Ban Ki-moon, the United Nations secretary general, has promised to call a meeting of heads of state in 2014 to push for a global agreement on radical policies to cut carbon dioxide emissions. While details are sketchy at this stage, indications are that any country that exceeds its carbon budget will be required to ‘capture’ the excess carbon dioxide and store it underground! One can only hope that our government has learnt that signing the country up to such international agreements does the public a grave disservice. The Kyoto Protocol forced New Zealand to adopt a pointless wealth-destroying emissions trading scheme, that might have satisfied environmental activists at the time, but which has imposed huge on-going costs onto struggling households and businesses. The sooner that our Prime Minister follows the lead of Tony Abbott in Australia and stands up for the public against this sort of environmental extremism, the better. Should NZ sign up to a proposed United Nations ‘carbon budget’ scheme?